Thomas from Germany was our second ´group´ of the year out to take on the Orellana Carp. On his arrival strong easterly´s were forecast for most of his trip, so I decided to tackle the lake a little differently. The Orellana carp are very temperamental when it comes to easterly´s so we were to try to pick off patrolling fish, as they rarely get their heads down on such winds. As I had been away to the early hours of the day he arrived, I hadn’t had chance to look around and check for showing fish. So on arrival at our chosen area, I was delighted to see crashing fish, not as much as him, as I had already warned him of the situation. We had 4 runs within 36 hours, not big fish, but more than welcome in the hard conditions. Over his visit we moved pegs a couple of times when needed, there was a couple of days that the weather changed, so we adapted accordingly. One such move produced a fish within 40 minutes and 9 runs the following night. So it was worth it…. We both worked hard for the runs we had, Thomas and myself had well over 30 runs between us, mostly small fish around 20 – 25lb. Thomas had a couple of cracking mirrors, his biggest fish was a little under 36lb, whereas myself, ( as he was alone, I fished alongside him) I had my first 40 of the year at 44lb and a 36lber. All in all it was a hard session, however we had some great laughs. I was practicing my German on him (´einbahnstrasse´) one of the only words other than swearwords I remember from my childhood there. 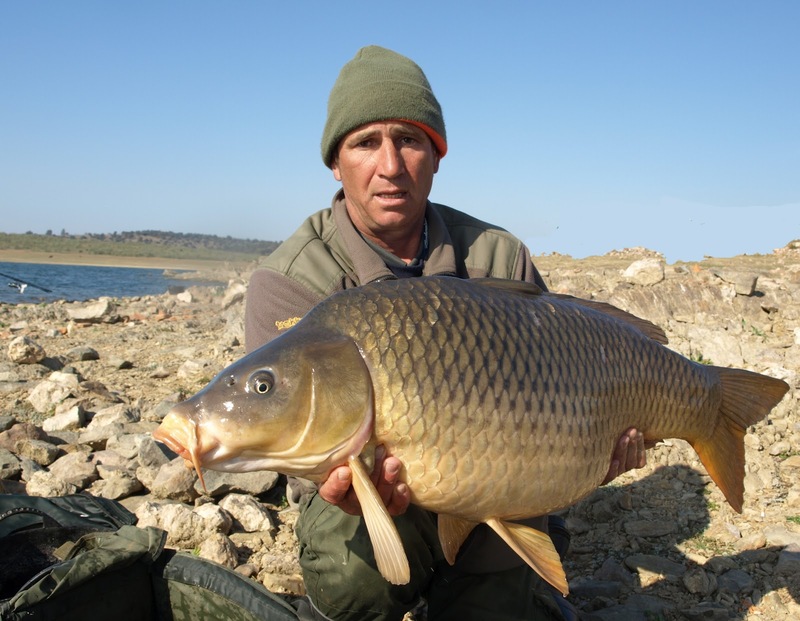 Well done Thomas (beer monster), he did well taking on the Orellana in hard conditions…..
Over the easter period I managed time to chill out and fish with Spanish friends, it’s a little different to our style of carp fishing, I was invited to join Miguel and friends for a couple of days, The fishing was a little slow, the temperatures dropped to 5 degrees, and that’s without the wind chill, it was bloody freezing. I did warm up a little when I managed to sneak into their 6 man bivvy, watch the Madrid game on their Tv and sample a couple of Spanish drinks. So with Easter over, we are all prepared for our next group. The forecast gives strong westerly´s for the next week or so… Lets hope it stays the same until our next carp anglers are over in a weeks time………. this week the lads are over for pleasure fishing only.